Where can I play tennis and other raquet sports? The Gilford Hills Tennis and Fitness Club (603) 293-7546 offers tennis and other raquet sports. The facility features three outdoor tennis courts. Indoors, there are four tennis courts and three raquetball courts. The City of Laconia offers several free facilities for raquet sports. There are five outdoor tennis courts at Memorial Park, off of Court Street. There are two lighted outdoor tennis courts at Leavitt Park on Elm Street. And there is a raquetball court at the Community Center on Union Avenue. 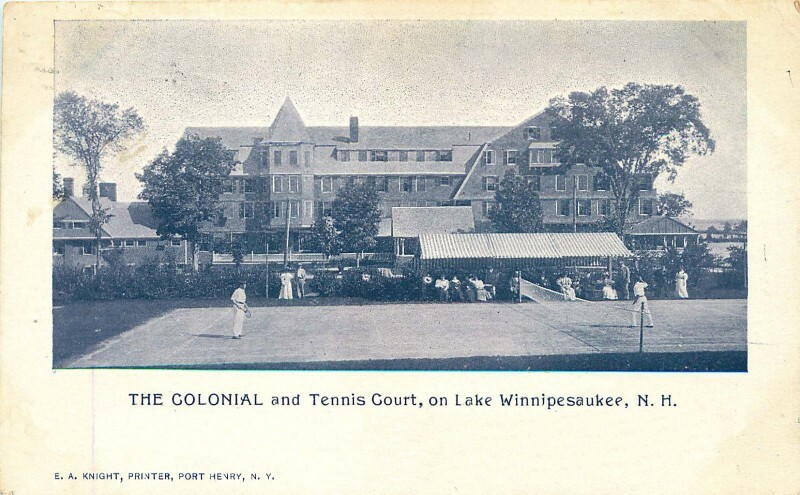 Tennis being played at the Colonial Hotel in Center Harbor. Postmarked August 1, 1906.